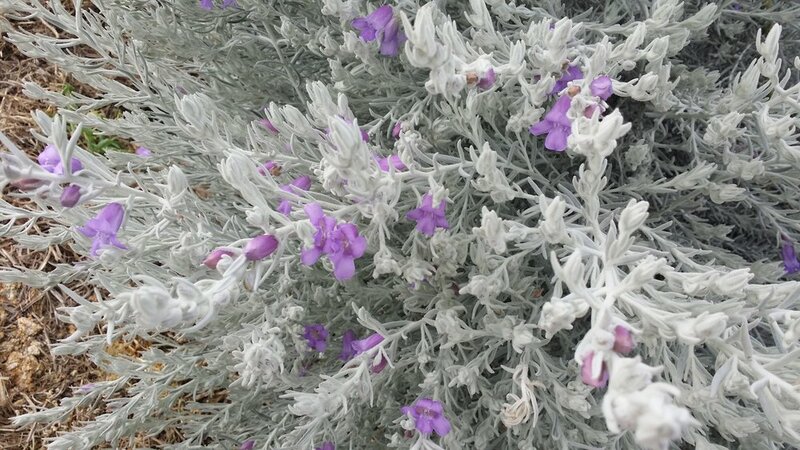 A beautiful, Australian, silver-grey shrub, 1m-2m tall with small, lavender coloured flowers in late winter or spring. It comes from the northern areas of SW WA and grows well in improved, free draining soil. Prefers full sun or full sun and part shade. 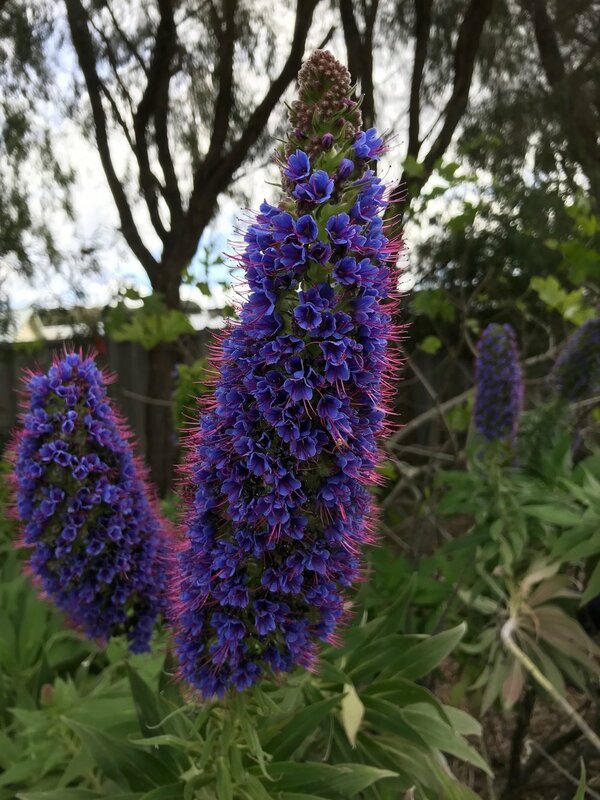 A striking, architectural shrub 2-2.5m tall and wide with candle-like flower spikes in blue, purple or pink in spring. 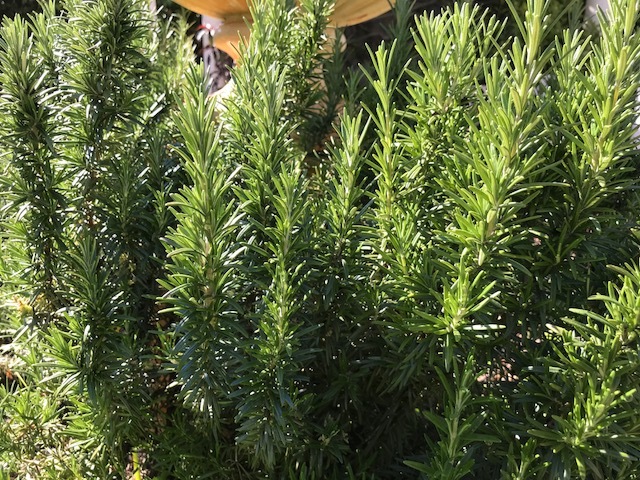 It is a water wise, Mediterranean plant with attractive grey- green foliage and tolerates coastal conditions and full sun but also grows well in part shade. Closely related to hibiscus, these plants have pendulous, lantern-shaped, flowers in pink and autumn tones for most of the year and maple-like soft leaves. They need a frost free position and free draining, fertile soil and afternoon shade in summer in hot areas. Prune to maintain shape in winter if they become leggy. Plants come in forms from groundcovers to shrubs up to 2m tall. The popular dwarf ‘Lucky Lantern’ series grow to just 30cm tall and wide, making them good pot specimens. A shrubby herb with aromatic, needle-like leaves and small blue flowers (though pink and white forms are also available) in spring or summer. It can be trimmed into a standard, grown as a shrub, clipped to form a hedge and prostrate forms spread quickly and drape attractively over walls. The leaves are used to flavour food, and it’s especially good with lamb and roast potatoes. The variety ‘Tuscan Blue’ is one of our favourites. Bob Longmore grows these two edible plants in his Nannup garden. Buddah’s hand (Citrus medica var. sarcodactylis) is a citrus with fruit segmented into finger-like sections, resembling a human hand. The fruit is very fragrant and is mostly used for perfuming rooms and clothing. It can be candied like fruit from an orange or lemon. Its cultural requirements are similar to lemons. It can be kept in a big pot and will reach 3m-4m tall if planted in improved garden soil. Leafless peas ‘Lacy Lady’ are a dwarf green, podded pea that is considered to be semi leafless or leafless. They have a few leaves and many tendrils which contribute to photosynthesis in a similar way to leaves. They are a vigorous plant which is popular because they are less likely to be damaged by severe weather and more drought tolerant than conventional peas. Plant them from pea seeds so they grow in the cooler months. 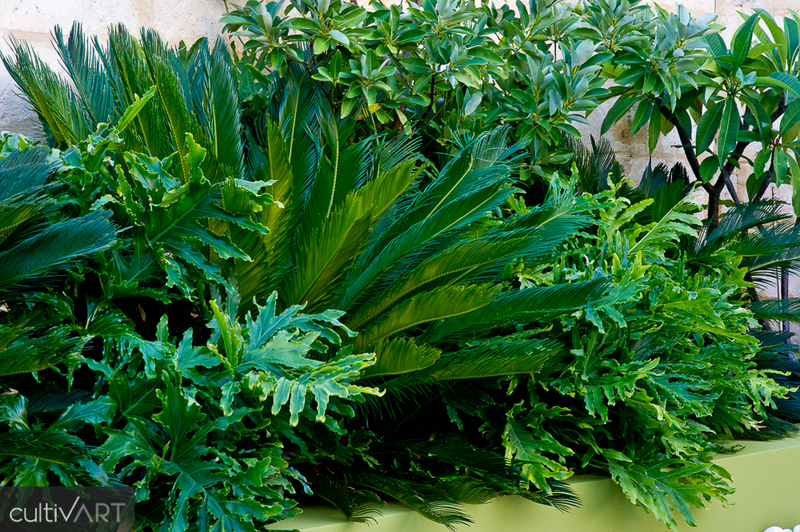 Three of Janine Mendel's favourite plants for creating lush sub tropical gardens are the sago palm cycad (Cycas revoluta), Philodendron selloum 'Compacta' and frangipani. The cycad is prone to frizzle top in Perth's alkaline soils. This is a nutrient deficiency that is treated with foliar sprays of manganese sulphate. Hibiscus rosa-sinensis 'Snow Queen' has green foliage splashed with white and if grown in full sun has dramatic red single hibiscus flowers. It grows to 1.5m to 3m tall but can be trimmed to size. In this photo taken in Janine's garden it contrasts with the lobed foliage of Philodendron selloum ‘Compacta'. Dwarf sacred bamboo (Nandina domestica) has beautiful bright red tints to its lacy foliage, suits sun or shade and is available in a range of sizes to suit every garden. Here it is teamed with an edging of native violets (Viola hederacea). Frangipani are easy, waterwise plants for warm temperate, sub tropical and tropical climates and have fragrant blooms during warm weather. A fast-growing evergreen native, also known as the bush cherry which is widely found across Australia. The Tucker Bush variety is psyllid-resistant and in summer produces edible red berries that are apple-like in texture with a mild sweetness. They may be eaten fresh or made into jams, jellies, muffins, biscuits, cakes and wine. It grows 3-4m high and 2m wide but can be easily kept as an edible hedge at 1m high. Prune regularly to promote new growth. Illawarra Plum is also known as the Daalgaal, Goongum or Plum Pine. Its juicy, pulpy fruits have a grape-like texture and sweetish, mild pine flavour that is enhanced by cooking. It is a rainforest species endemic to the east coast of Australia. Illawarra Plum fruits are made up of two segments – a hard inedible seed (1cm in diameter), and a large, fleshy purple-black berry (2.5cm in diameter). They ripen between March and July, and are eaten raw or made into a jam or jelly. When cooking with Illawarra Plums, stainless steel utensils are recommended over aluminum to prevent bitterness. Fruits may be picked from the tree, but will also fall to the ground when ripe. This species is/dioecious/, meaning you’ll need both male and female trees to produce fruit so plant several or use as a hedge. Illawarra Plum grows in full sun and part shade and prefers a rich, moist, non-alkaline soil, but will tolerate a range of well drained soils and coastal positions. It grows slowly and can be kept in a pot to reduce its size. In the ground it can reach 8 – 12m in height. Pistacia Chenensis is a beautiful deciduous tree that can withstand harsh conditions. It is considered a small to medium sized tree and is often planted for its attractive foliage. It has a slow to moderate growth rate and prefers well drained fertile soils in full sun. The 'Forest Pansy' is a beautiful ornamental flowering tree. It is a purple leaved small specimen tree that provides year round interest. It tolerates a variety of soil types, but does best in moist, deep, well-drained fertile soil. It's best to avoid excessively hoy or windy positions. Plant in full sun or part shade. These beautiful succulents have round spoon like leaves. They are extremely hardy and the sunlight brings out a bright red colouring in the leaves. Mesembryanthemum's are available in a wide range of colours and traditionally grown as a ground cover. They are commonly known as "pig faces". They flower for 10-12 weeks during spring. Philodendron Xanadu belongs to the family Araceae and subgenus Meconostigma. It was originally discovered in Western Australia. Deryn describes this shade plant as the “landscaper’s friend” because of its beautiful lush, tidy leaves. It is incredibly tough and grows up to 40cm tall. It’s compact growth habit and decorative leaves make it a perfect addition to your garden. Ruscus aculeatus is a summer dormant shrub that is native to Italy. The common name “butchers broom” originates from it use of scrubbing butchers blocks and cleaning chimneys. Steve describes it as the “florist’s favourite” due to its instructive nature and its beautiful dark emerald green foliage. Ruscus is a relative of the asparagus family and stems can but cut up to 1 metre long. These decorative stems can be kept in a vase for up to 6 months. Ruscus looks fantastic on its own or when paired with some beautiful flowers. flowers in compact clusters year round. and wide or keep it clipped to about 30cm tall. It travels using creeping stems and is sterile so it will not seed into bushland. Plants are drought tolerant and flower best in full sun but can be grown in part shade. Lantana montevidensis is a fabulous plant in hot dry areas of Western Australia and South Australia and other dry climates but is an invasive weed in tropical areas and the east coast of Australia. Australian native, this select form has extremely compact foliage making it ideal for topiary creations. It also makes an excellent hedge from 1 to 3 metres in height. New foliage produced in winter is a rich burgundy contrasting beautifully against the mature dark green foliage. When using as a hedge space plants 3 per metre for optimum results. Will thrive on one to two watering’s a week once established. One of my absolute favourite geraniums is a cranesbill type known as geranium Rozanne. The flowers are a beautiful violet colour and it flowers for months on end. Geranium Rozanne was selected as the UK’s Royal Horticultural Society Plant of the Century in 2013, with good reason. It has exceptional flowering and grows in just about any soil type.